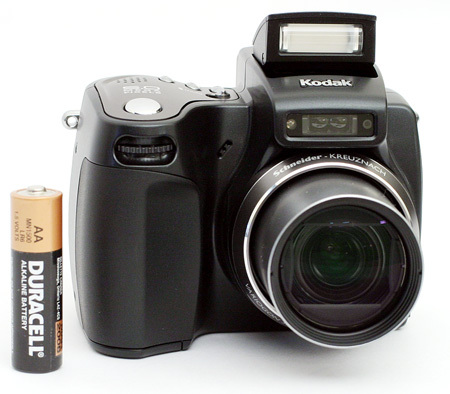 The 5 megapixel DX7590 replaced the 4 megapixel DX6490 as Kodak's second 10x ultra-zoom digicam. The DX7590 features a Schneider-Kreuznach lens capable of a 38 - 380mm zoom (35mm equivalent). It offers a wide range of still recording modes from full auto to manual exposure in addition to 14 preset scene modes and a movie mode with a maximum resolution of 640x480. Like all of Kodak's EasyShare cameras, the DX7590 has an intuitive menu and controls that lead to a hassle-free shooting experience. In our review, we found that although the DX7590 has a lot going for it, it has some noteworthy downfalls as well. For example, it performed well with regard to color reproduction and shutter lag. However, the camera really slows down when the buffer fills up. The most significant problem with image quality is that the DX7590 uses a very aggressive noise-reduction process that results in a soft/muddy appearance. Read on for all the details and a closer look at the performance of this ultra-zoom digicam.